Eight Mile is an unincorporated community in Mobile County, Alabama, United States. The community is named for its distance from the city of Mobile. 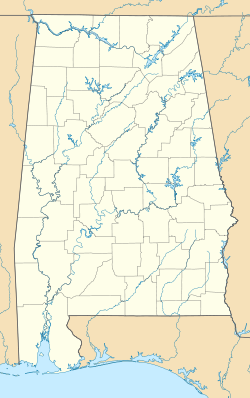 Part of it was annexed in the mid-20th century by the city of Prichard, Alabama. Eight Mile is located west of Mobile Bay and just north of the Gulf of Mexico. The elevation is 33 feet (10 m). The mostly African-American enclave had a median income in 2014 of $35,000. This is more than $8,000 lower than the state median. In 2008 lightning struck a mercaptan storage tank at a Mobile Gas Service Corp. underground natural gas pipeline at the Whistler Junction gas transfer facility within the Eight Mile community. An estimated 500 US gallons (1,900 l; 420 imp gal) of Mercaptan, the chemical odorant added to natural gas to help detect leaks, spilled into the soil and groundwater for 6 months, according to Alabama state environmental officials. It has migrated to ponds and surfaced, polluting the community's air. Beginning in 2011, residents in Eight Mile began complaining of an overwhelming mercaptan odor and associated health problems. They have concerns about the damage to their health from the chemical, and to property values from its persistent rotten egg smell. They appealed for a state and federal investigation. Mobile Gas officials maintained that the odor had nothing to do with their operations; they did not publicly acknowledge the leak or the lightning strike until April 2012. In subsequent court documents, Mobile Gas acknowledged the leak, but claimed the responsibility is with the waste cleanup firms they had hired to get rid of the spilled chemical. Sempra Energy acquired the Eight Mile facility several months after the accident and owned it until September 2016. Sempra Energy also owns the well that caused the massive 2015−16 Aliso Canyon gas leak in the Santa Susana Mountains and San Fernando Valley of Southern California. In 2015 Mobile Gas started operating a new water pollution remediation ozone treatment process system. Mercaptan was federally reclassified as a hazardous chemical by the Frank R. Lautenberg Chemical Safety for the 21st Century Act, passed by Congress and signed by President Obama in 2016. ^ a b c d e "Feature Detail Report for: Eight Mile (Mobile County, Alabama)". Geographic Names Information System. United States Geological Survey. Retrieved January 8, 2013. ^ a b c d e f Penn, Ivan (October 15, 2016). "We cannot breathe:' A poor Alabama town has lived with the rotten egg stench of gas for 8 years". Los Angeles Times. Retrieved 15 October 2016. ^ a b c d e f DeSmog Blog: "Eight Years After a Mercaptan Spill, Residents of Eight Mile, Alabama, Call For Evacuation"; by Julie Dermansky; 8 August 2016. ^ a b c Blog @ AL.com: "Mobile Gas may have leaked more than 6,000 pounds of mercaptan in Eight Mile over six month period"; by Ben Raines ; 12 February 2013. ^ WPMI−Local 15.com: "8 Mile residents seek state & federal help with odor"; by Modupe Idowu; 20 June 2016. ^ a b WKRG−News 5.com: "Eight Mile Residents Cry For Help From The Feds To Investigate Mercaptan Gas Leak"; by Emily DeVoe; 23 June 2016. ^ a b Alabama Department of Environmental Management, Eight Mile Mercaptan Summary]; 8 June 2016; @ eight-mile-summary-6-20-16.docx . ^ "Mikhail Torrance". Rolltide.com. CBSi Advanced Media. Archived from the original on 2 April 2015. Retrieved 16 March 2015. This page was last edited on 26 September 2018, at 18:53 (UTC).